The Alaska Supreme Court has cleared the way for undeclared and nonpartisan candidates to run in the state Democratic party primary. 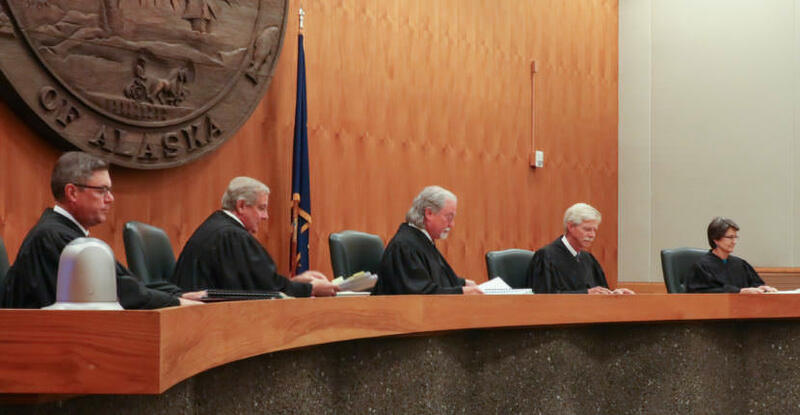 The court Wednesday affirmed a decision by a lower court judge who ruled in favor of the party. The decision would allow Gov. Bill Walker to run in the primary if he chooses to. The court case was prompted by the Alaska Democratic Party changing its rules to allow unaffiliated and nonpartisan candidates to run in its primary. The state opposed the change, citing a law that required candidates be registered members of the party they seek nominations for. Juneau Superior Court Judge Philip Pallenberg ruled in favor of the party. He decided that parties have the right to associate associate themselves with the candidates of their choice, regardless of their party registration. Alaska Democratic Party Executive Director Jay Parmley said party officials are “thrilled” the court issued the ruling quickly, only six days after hearing oral arguments. “All we’re saying here is that if you’re a registered Democrat or if you’re one of these 56 percent of the state, which is not a member of an organized political party, and you want to run and seek our nomination, you should have that opportunity,” Parmley said. Through Tuesday, there were 206,032 undeclared registered voters, 83,856 nonpartisan voters, 139,357 Republicans and 74,869 Democrats. With less than two months until the June 1 primary filing deadline, no one has filed for the Democratic primary for governor. Parmley noted that there’s widespread interest in whether former U.S. Sen. Mark Begich will seek the Democratic nomination. But Parmley was also complimentary toward Walker, who is registered as undeclared. “I continue to believe the governor has navigated pretty rough terrain over the last three and a half years and has continued, along with the House Democratically led majority, to – on a broad framework, not getting into the weeds – been sort of the adult in the room, advocating for a really sound, responsible, comprehensive fiscal policy,” Parmley said. Walker’s daughter and campaign spokeswoman Lindsay Hobson said the campaign is analyzing the decision. Alaska Republican Party Chairman Tuckerman Babcock said he’s pleased with the decision. He said it parallels the principle that parties determine who can vote in primaries. “It makes sense, perfect sense, that you also have a constitutional right as a party to determine who can offer themselves as one of your candidates in your primary,” Babcock said. Babcock said it backs the Republicans’ decision to change party rules to bar from the party’s primaries any Republicans who caucus with another party. That would include state representatives Gabrielle LeDoux of Anchorage, Paul Seaton of Homer, and Louise Stutes of Kodiak. State Division of Elections head Josie Bahnke ruled the change was made too late and violated state law. Babcock said he’ll ask Bahnke to reverse herself based on new decision. And he said the party will go to court if she doesn’t.